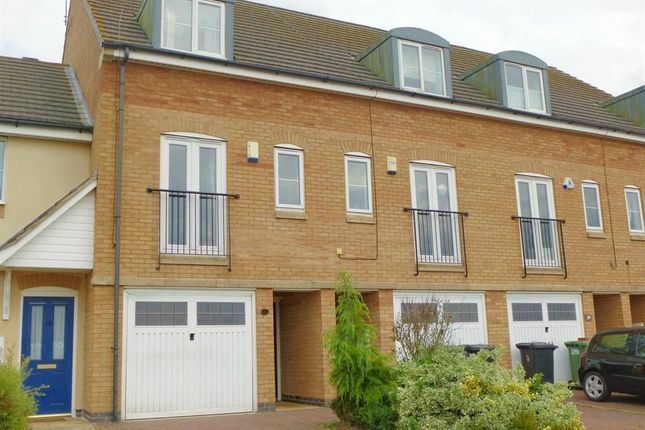 Modern 3-storey townhouse located in Hampton Hargate, close to schools and local amenities, has easy access to Fletton parkway, A15 and A1(M). The property overlooks the local play fields and provides a kitchen/dinner, a lounge with Juliet window and three double bedrooms with the master benefiting en-suite shower room. Cloakroom/bathrooms are all in excellent condition. The accommodation boasts internal floor area of 123 square meters and the converted integral garage offering more living space. Outside there is an enclosed rear garden with patio and drive way on the front for parking . Radiator, telephone point and staircase to first floor landing. Fitted kitchen with a range of wall and base level units with worktops over and tiled surround, one and a half stainless steel sink and drainer, double oven with gas hob and cookerhood over, plumbing for washing machine, space for fridge freezer, plumbing and space for slimline dishwasher, central heating boiler, radiator and tiled floor. UPVC double glazed window and double glazed door to garden. TV and telephone points, UPVC double glazed window to front and UPVC double glazed french doors to front with Juliet balcony offering views across the playing fields. Radiator and UPVC double glazed window to rear. Comprising of a two piece suite to include wc and wash hand basin with tiled splashbacks. Radiator and extractor. Airing cupboard and access to loft. Radiator, TV point and UPVC double glazed window to front. Comprising of a three piece suite to include wash hand basin, wc and shower cubicle with tiled surround. Tiled flooring, heated towel rail and extractor fan. Double glazed velux window to rear. Part tiled family bathroom comprising of a three piece suite to include bath with shower attachment, wash hand basin and wc. Radiator and extractor fan. Hampton hargate is the first of The Hamptons to be built and has since matured into a peaceful and relaxed village of rich community life. The village is served by its own sought-after primary school, Hampton Hargate Primary School (Ofsted rating as Outstanding), and a secondary school, Hampton College. Hampton Hargate also has a community centre, local shops and restaurants. For recreation, there are extensive playing fields, children’s play parks and a lake, Serpentine Lake. The large shopping centre, Serpentine Green, compromising a Tesco Extra and many other High Street names is in easy access. * Please quote ref. 5706909 when enquiring about this property.